‘What do escalators in Medellín, Arabic lettering in Amman, story-telling furniture from London, urban farming in Detroit and a co-living complex in Tokyo have to do with the Bauhaus?’ asks Deutsche Welle’s web site. 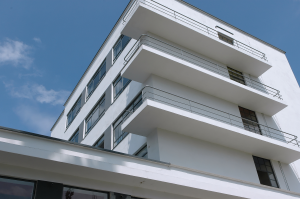 They all draw from ‘the influence that the philosophy of the Bauhaus movement still exerts on the globalized society of the 21st century,’ a time that has its societal parallels with the year 1919. To illustrate those parallels as well as the continuing relevance of Bauhaus teachings, ‘we meet architects, urban planners, designers and artists from around the globe who, in the spirit of the Bauhaus, want to rethink and change the world.’ True to its title, Bauhaus World’s journey involves a wide variety of countries, and not just European ones: different segments profile the work of Bauhaus-influenced designers everywhere from Mexico to Jordan, Colombia to Israel, the United States to Japan. It’s in Japan, in fact, that the first part of Bauhaus World, ‘The Code,’ finds the outer reaches of the spread of Bauhaus that began with the exile of its members from Nazi Germany. The second part, ‘The Effect,’ deals with the enduring influence that has turned Bauhaus and its principles from a movement to a brand, one that has potentially done more than its share to make us as design-obsessed as we’ve become in the 21st century — a century that, the third and final part ‘The Utopia’ considers, may or may not have a place for the original Bauhaus ideals. But whatever Gropius, Klee, Moholy-Nagy, Albers, and the rest would think of what the Bauhaus they created has become over the past hundred years, over the next hundred years more and more designers — emerging from a wider and wider variety of societies and traditions — will come to see themselves as its descendants.